How Are Your Lowered Expectations Doing Thus Far in 2016? I am really enjoying under achieving. Since I've diminished my expectations I have gotten a lot more done. Take for instance my blog posts. I usually have quite high standards for what I post. I feel a responsibility to educate, amuse and inspire my readers. Does this responsibility create good blog posts? I think it creates less frequent blog posts because I tend not to write a post unless I feel I have something incredibly useful to tell you. Now that I have diminished my sense of responsibility I think I can write more posts imperfectly. if you will still read them. I have wanted to post this photo since I took it in October at the Pitti Palace in Florence, Italy. 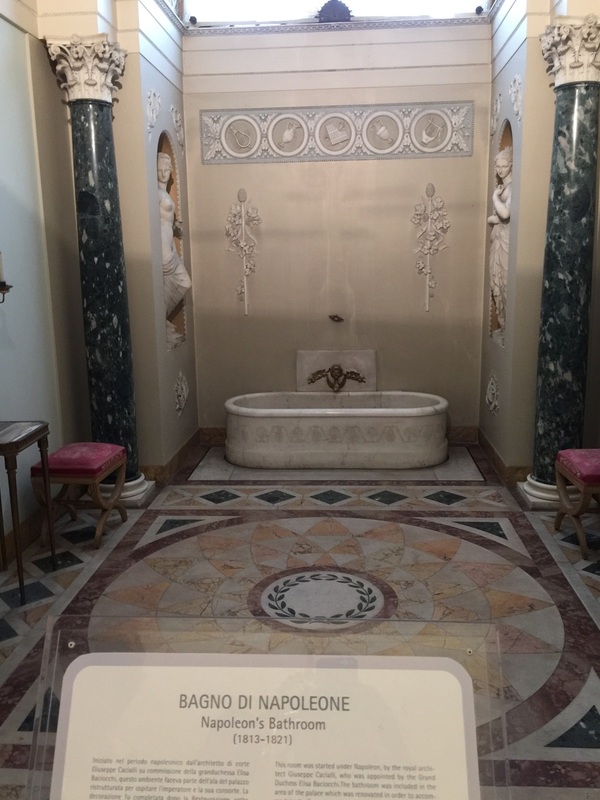 I was embarrassed to admit to you that I was really looking forward to visiting the Pitti Palace,( where the Medicis once lived,) to see among other things, Napoleon's bathroom. Now that I have a new attitude, I am sharing the picture with you. What do you think of his bathroom? It's nice, but not so hot, I guess I should have not had such high expectations for his bathroom. However, I did read that he formulated plans for the battle of Waterloo while soaking in the tub. I really believe in traveling so that we can learn about people, places and art. Isn't it helpful for you to learn that Napoleon actually soaked in a bathtub? Imagine the possibilities... Please let me know how lowering your achievement standards is working for you, or whatever else you chose to do?